This morning I wanted to make something delicious, but easy and kid-friendly as Z and I are yet again on our own. I know, potentially crazy, but seriously fun! If you want to teach your child a language but think your skills may be rusty, ask your library to reserve Muzzy- it’s a language learning package for kids with a DVD, story, workbooks- it’s what we used as kids in school and Muzzy the monster is incredibly love able. But I digress. This recipe needed to potentially feed 1 or 2 and I didn’t want leftovers. 2 pieces of high quality chocolate. I used Divine dark. Lay your puff pastry flat and work quickly. Cut the sheet in half so you have two rectangles. Fold in half lengthwise and place your chocolate pieces in the center. Press the sides together to seal. Place pastry on ungreased parchment paper. Turn down oven to 400F and place pastry in oven for 20 minutes. Remove and let cool a little. 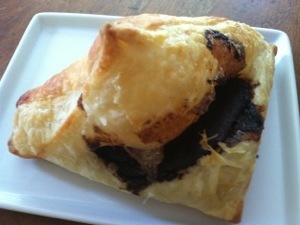 Enjoy this flaky, easy chocolate treat for breakfast OR dessert!